For the Fruit, here is what I used but feel free to use whatever you like! Mix together oats, almonds, oil, honey, vanilla and salt. Push that mixture into a (sprayed with cooking spray) 12 inch pie plate. make sure to push from the center and then use your hands and fingers to form the outer crust evenly. Once done forming the tart crust, bake for 20 minutes. Set on cookie rack and let cool for 30 minutes. Meanwhile, slice fruit to prepare for topping. Once tart crust is cooled, scoop in and smooth out the yogurt layer. Finally, top with your fruit, working from the center out. You can follow my pattern or create your own! Remember- the tart will not serve in a sliced form. It will be messy as the yogurt is not set. its ok, just enjoy the initial presentation and the flavor of the tart! 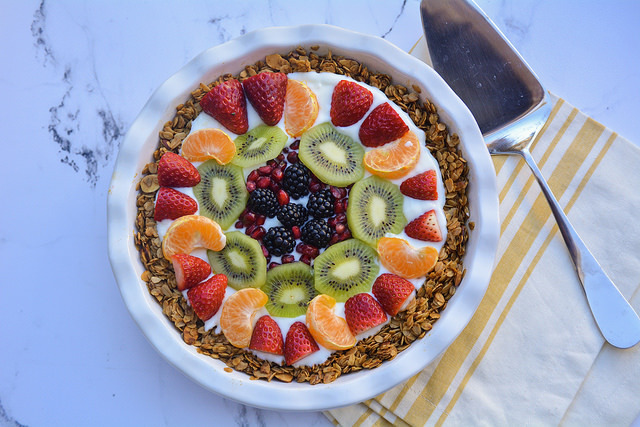 The brunch inspiration continues with today’s recipe for a beautiful fruit and yogurt parfait tart! This is one of those dishes that is almost too pretty to eat. It also happens to be healthy and delicious. Did I also mention it’s just three easy steps to get you to the final product? I said in my post earlier this week (Spanikopita Egg Bake Casserole) that I hosted a brunch gathering with friends and tried out all these recipes. This tart got some high praises and recipe requests. It’s just so bursting with bright colors and then hits the mark on the taste test too. I do have to preface the serving results before you make the dish. It’s gorgeous as a full tart. But, the crust is crumbly and the yogurt is not molded into the pie, it is simply poured in as a topping. With that said, it will not look pretty when served. It’s ok to just take a big scoop out of the dish and not worry about the cut of it. This dish is all about initial presentation and the mouthful of flavor you get while eating. 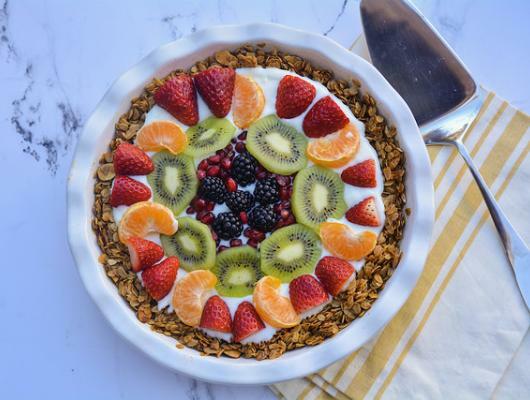 After you taste the sweet crunch of granola, the smooth and creamy yogurt with the pops of fruit you’ll forget all about what it looks like.Bookmark this recipe for your next holiday or event. Change up the fruit for the season or the occasion to match a color scheme for your own personal twist. Once you have the tart part down, the design possibilities are endless! Now on to the easy recipe….